Since I'm hosting a card challenge over at the Silhouette Plus Forum I thought I better get busy and make some cards for it. 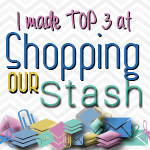 Since I have not found the majority of craft supplies it had to be something that wouldn't take a lot in the way of supplies. The lady is clip-art from Dover. She was originally a black and white image. I traced her like usual in my Studio software. Then I duplicated the cut lines only not the image to make the card base. After I had my card base designed I went ahead and put her on top of the card base. I had to do a little bit of re-sizing in order to get her sleeves to come out right at the fold. Then I made sure that the image was set to no cut as I only wanted the printed base to cut out. After she was printed and my Cameo cut her out I used my chalks to color her. This was a quick card to do. When I thought of what to do for the challenge this was the first file I made. Because the image is rounded I had to do this a little differently. The image is another Dover image. 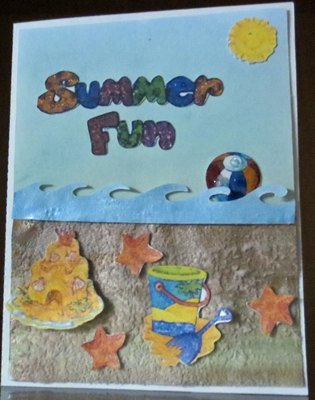 For this card after tracing the frog I copied the cut line again and made my card base. I cut the frog out separate from the base. If you look at the back you will see the frog overlaps a little where the fold is. 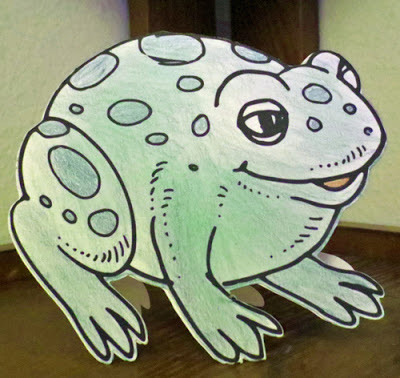 I colored the frog with colored pencils and chalk. No comments on my kindergarten coloring. LOL! Because the adhesive I usually use exploded (thank goodness I had the foresight to put it in a plastic bag) I ended up using a glue stick to glue my frog image to the front of the card base. Those I had no problem finding. I still haven't found my tape runner. The missing craft supplies will probably be in the last box I unpack. I was working on a third shaped card using offset cut lines as the image was too small to enlarge without really distorting. Also I wanted to stamp a sentiment on the card. Hopefully I'll soon find my clear stamps. If not then I'll cut out a sentiment using my Cameo. There you have it my playing making print and cut shaped cards. A good way to spend a hot day inside where it is cooler. Thank you for stopping and leaving comments. I hope if you are where it is hot that you are staying cool. I hope my faithful readers you have not given up on me. I am finally moved although it will take me some time to unpack and find things. 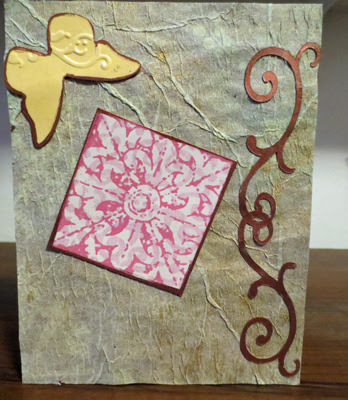 I played last week with my stamping gear but decided since I'm co-host over at Silhouette Plus for the card challenge that I better make a card. This month the theme is beach and with Summer officially beginning last Friday what better time. This is my entry for the challenge. Except for the wave the images were stickers that I scanned in. Sorry I don't remember who made the stickers. I turned them into print and cut.. For the beach ball I added Dimensional Magic and with the tip blended some of the dots together near the bottom to look like water. Normally I would pop any bubbles but this time I left the bubbles in as I thought it made for more realistic water droplets. Although the wave was colored since I made everything print and cut I went ahead and used my metallic blue watercolor paint and then sprinkled some sea salt on the wave. I used a couple of blue metallic chalks for the sky with a cosmetic puff since I couldn't find my cotton balls. For the sand I used metallic watercolor paints. Sprinkled sea salt over the wet paint. Then used a wet brush with more paint over the salt. The water dissolved the salt in some places and I think made for more realistic looking sand. I discovered my glue was not going to hold as it picked up the salt. I ended up using some strong double sided tape to adhere things down. Happy Summer! I hope you are enjoying beautiful summer weather. Alas I thought I was escaping the rain but it has been raining almost every day since I moved. My dogs though feel right at home and are enjoying our walks. I'm not sure what I will do next. I would like to try some of the techniques from the Technique Junkies newsletter. I also need to make a card for the card challenge I'll be hosting in July. Thank you for dropping by and leaving comments. Wishing you Happy Frugal Crafting till we meet again! O.K I must confess. I was getting crabby with all of the sorting and packing of things for my move come the weekend. I have to have my crafting fix that is all there is to it. But what is a girl to do when the majority of her crafting supplies are packed? Improvise of course. So although the technique of the week was using designer paper I decided to use a piece of wrapping paper from a roll I was going to toss. Although the technique uses tissue paper I ended up using a single ply piece of facial tissue. I sprayed my faux silk with my homemade glimmer mist. Oops! I forgot the bottle has a bad sprayer and got dark splotches instead of what I was after. Since I was playing I went ahead and sprayed clear water which caused the splotches to run and created some interesting vertical lines. Then since my Perfect Pearls are packed but I had some gold powder used with polymer clay not packed yet I sprinkled some of that on the wet paper and sprayed with clear water once again and then carefully blotted with a paper towel. I love the result and by blotting the design of the wrapping paper shows through as the paper towel picked up excess color from the mist as well as the gold. Unfortunately the pictures doesn't do the card justice as the gold really sparkles on the card. The butterfly and flourish were on my cutting table which I was clearing in order to pack things today. I edged the butterfly with a copper paint pen and painted the flourish. I was going to toss the card stock left over from playing with stamping using two different images on my cube stamp but decided instead to cut out one of the squares which I really liked how it turned out. I also edged that with the copper paint pen. 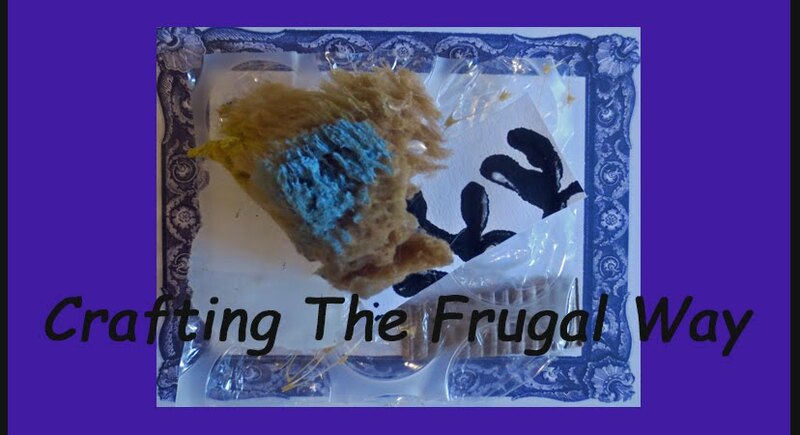 There you have it my frugal card using what I had on hand. There are lots of interesting wrapping papers around even at places like the dollar stores. Also if you have some designer paper that perhaps you have fallen out of love with this would be a good way to use it. Thank you for looking and leaving comments. Wishing you Happy Frugal Crafting till we meet again. 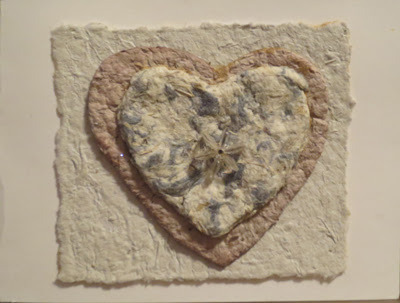 A little over ten years ago I was experimenting with paper making using junk mail and other paper. I also experimented with putting different things in the paper pulp like glitter, dog hair, and even dryer lint. I experimented with different ways of making shaped papers as well as coloring my paper. While packing up things I came across this card as well as some others I made during that time. Alas I did not know that over time rubber cement would cause discoloration so most of the cards ended up being tossed. Surprisingly the card I gave my sister does not show signs of discoloration as she has it on display. So I did not know about the discoloration until I came across the other cards recently while packing things up. But I'm getting sidetracked here. So here is the notecard I made. I used open cookie cutters for the two hearts. The small heart has dog hair and dryer lint in it. I don't remember what I colored the larger heart with but it has some glitter in it. I used a plastic bead in the center. Since this time I have seen plastic canvas used for paper making. 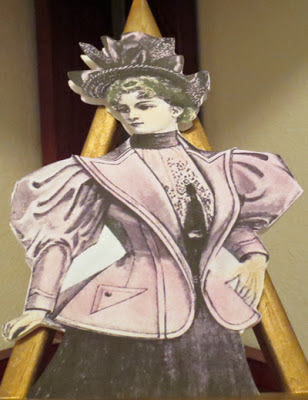 Once I'm settled in my new place I'll have the space to play once again making paper and paper embellishments. I did pack my paper dedicated blender. I want to see if I can make paper in an embossing folder using the pulp instead of another way I've recently played doing it. Thank you for stopping by and looking. I should be back crafting in a couple of weeks. In the meantime wishing you Happy Frugal Crafting till we meet again.